Classic Kafka. Versatile actor Chris Hendrie brings this interesting, odd and unusual tale to vivid life. 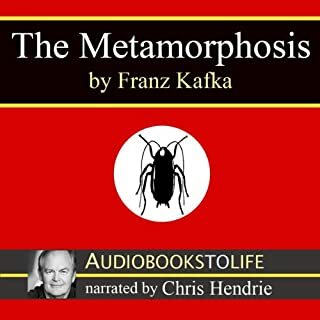 This unabridged novella is the bizarre story of a young man, Gregor Samsa, who is mysteriously and instantaneously transformed into a monstrous cockroach. Need I say more? Very good story, a good read for anyone. The book is not professionally produced. Or the transfer. It gets extremely quiet 1/3 of the way through. Then goes loud. Then quiet. I’ve found the same issue with this company on other books. I love the story, but kinda would like my money back as the production values are so poor. Kafka was a master. Demian is marked as “Cain” of the story “Cain and Able”. Using that story as a jumping off point this is a reversal of “chosen ones” born with secret knowledge. 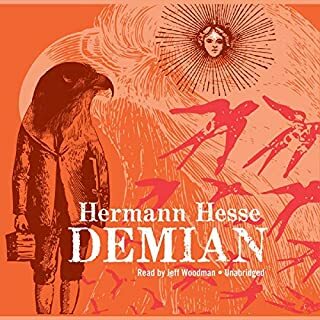 Demian is a kind of guide for Emil Sinclair. If you read Carl Jung, you’ll quickly see that much of the story was drawn from that. The problem for me isnt so much the story but the telling of it. Something about the Jeff Woodman’s reading for this book was off. It feels very pretentious especially when there isn’t a story being told but Emil Sinclair’s thoughts being hashed out. I wanted to vomit in these sections - reminded me of narration on Christian Right Wing radio. So, for me, a better narrator who could temper the story without coming off as preachy would have served this project better. I usually am careful listening to the audible reading samples, I missed this one. Listen to Carl Jung’s “Memories, Dreams and Reflections” instead. You’ll get the exact story with far greater depth and insight and far superior narration.